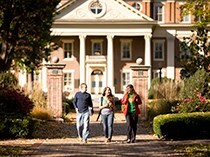 We hope this website gives you a good feel for Roanoke College, the kind of students who study here, and what makes Roanoke unique. If you like what you see and believe that you'd be a good fit at Roanoke, we are happy to set up a time for you to come and visit. When you're ready to apply, we want you to know that we treat each application personally, and we will spend time carefully reviewing your application. We are available to answer questions by text, phone or email, whichever works best for you. 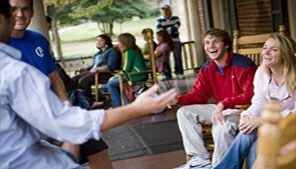 Roanoke welcomes transfer students and special (non-degree) students. About 15 percent of our students are transfers from other colleges. By definition, a transfer student is someone who has attended another college or university. If you're a high school student with Advanced Placement, International Baccalaureate or other college credits, you are a freshman applicant (with advanced standing) and should apply accordingly. 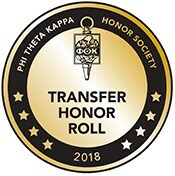 Transfer candidates must have a minimum 2.2 (on a 4.0 scale) GPA in transferable courses to be considered for acceptance. Questions? Try our Transfer FAQs or contact us. Have your secondary and college institutions forward an official transcript to the Office of Admissions. A GED is acceptable in place of a high school diploma. We'll need transcripts from all of the colleges you have attended. Complete the online application. Or, call the admissions office to request a paper copy of the application. The Admission With Advanced Standing (AWAS) form must be completed by the college currently attending or the most recent college attended. If you have less than sophomore standing (fewer than eight transferable courses or 24 credits), you must also provide SAT or ACT test scores. Our school code is 5571 for the SAT, 4392 for the ACT. Our policies related to credits from regionally accredited colleges and universities are available through the Admissions Office. Check into options for financial assistance. For instance, Roanoke does offer scholarships for transfers. Contact the Coordinator of Transfer Admissions for our transfer credit policy. Our policies related to credits from regionally accredited colleges and universities are online. Roanoke College does not discriminate against students, employees or applicants on the basis of race, color, gender, creed, religion, age, sexual orientation, marital status, national or ethnic origin, disability, or veteran status. Roanoke is coming to you! Counselors will be available at community colleges and transfer fairs to answer questions about the application process. Find out when an admissions counselor will be in your area. We look forward to meeting you soon! Roanoke offers you a wide array of majors, minors, concentrations and pre-professional programs. Check out our academic programs. There's a good chance we have what you're looking for. You'll find answers here to the most common questions transfer students have. If you don't see your question, don't be shy—call us at 800-388-2276 or send us an email.